I don't recognize either of these, Tom. I did get a Progressive Bee Fly last summer and that was the first one of those I had ever seen. There are so many things none of us get to see much less photo. Your close-ups are really very outstanding. I have to use a 2x or 4x magnifier to get this close. Great shot! 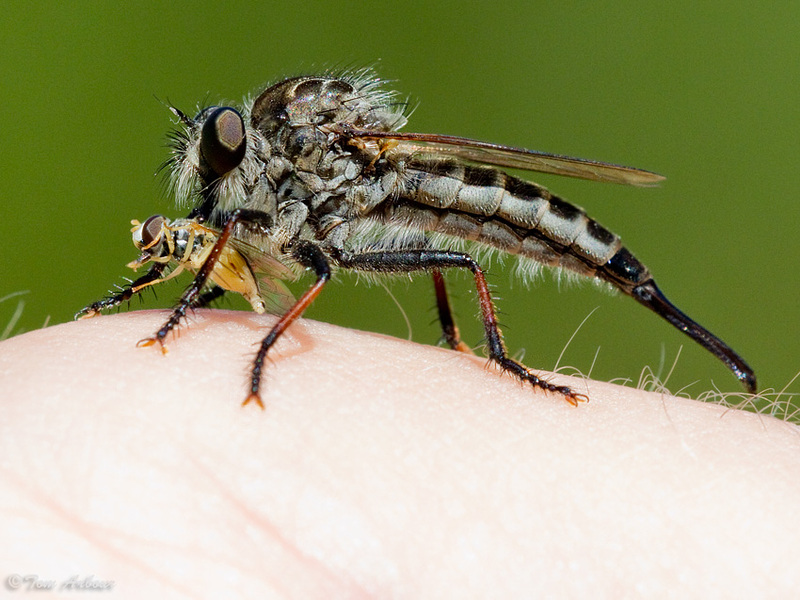 Robber flies intimidate even me! Abe- I think the prey is a Syrphid fly- also called hover fly or flower fly. They're tiny but I've seen them pretty often on flowers. My sigma 180 lens let's me see so much more than I can see with my own eyes, I love digital photography! Scott- I must say that this was not my own arm, but that of a co-worker. He didn't know much about robber flies- I don't think I would have waited as long as he did with it on him- but kudos and thanks to him for giving me this photo opportunity. Can you Tell I'm on a Roll? Leafhoppers!